Xchoppers.com - Prog. Susp. 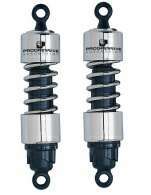 412 Series Gas Charged Shocks (Pair) - T100 - 12.5"
Prog. Susp. 412 Series Gas Charged Shocks (Pair) - T100 - 12.5"
Heavy Duty Shock Applications are recommended for bikes with additional add on accessories, rider weight over 200 lbs, or passenger use over 50% of the time. Please call Xchoppers to order shocks with HD springs (same low price). Prog Susp 412 Gas Charged Heavy Duty Shocks (Pr.) - T100 - 12.5"
Notify me of updates to Prog. Susp. 412 Series Gas Charged Shocks (Pair) - T100 - 12.5"